2 Bedroom 2 Bathroom Town Home in River Run Village. Walk to Ski Lifts. Enjoy the ski trip of a lifetime at this luxury-rated, newly constructed town home in River Run Village. Red Hawk Townhomes deliver premier accommodations in one of the most convenient locations to the slopes in Keystone. With over 1,200 square feet of living space, this two bedroom, two bathroom vacation rental provides guests with a spectacular experience within a ski resort that is consistently rated among the top in the country for families. Accessed by a private drive, this townhome provides luxury, privacy, and seclusion while lying within walking distance to all that River Run Village has to offer, including great dining options, the ski lifts, Dercum Square's mini golf/ice rink, Kidtopia, and countless other shops! Adventure awaits you at 2333 Red Hawk Town Homes! During your stay at this wonderful town home, you will have access to the adjacent Red Hawk Lodge which offers an abundance of amenities to guests. An outdoor pool and hot tub are nestled at the base of the mountain and offer fabulous views throughout all the seasons in the Rocky Mountains. A fitness room, steam room, and sauna are also located near the pool area. A billiards table is available to guests who need additional excitement following a day on the ski slopes! Guests always look forward to the 5-star services Gondola Resorts provides through its concierge team. Services include assistance with booking ski rentals, lift tickets, shuttle services, and reservations for other mountain activities, such as snowmobiling and horse-drawn sleigh rides. This spacious rental offers more living space than most other two bedroom properties in River Run Village, and features a fully remodeled kitchen with granite countertops and updated appliances as well as a fantastic dining room table to enjoy family meals together that will truly create lasting memories of your wonderful time spent in Keystone as a family or group of friends. The high-end appointments within this newly upgraded townhome perfectly compliment the luxury amenities afforded to you during your stay. This two bedroom town home has a master bedroom, furnished with a king bed, television, and en-suite bathroom. The guest room offers a queen bed that provides the perfect location to rest your head after a long day of skiing or shopping in River Run Village. A private single-car garage with an additional outdoor parking space in the driveway, free WiFi, and a private washer and dryer complete the amenities in this beautiful townhome. 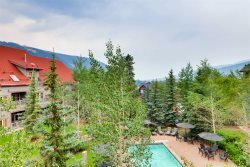 Prepare yourself for a mountain vacation like no other at this wonderfully serene location, located right next to River Run Village in beautiful Keystone, Colorado!